We spent last night as a family out on our trampoline dreaming about a big trip we are taking in the fall. 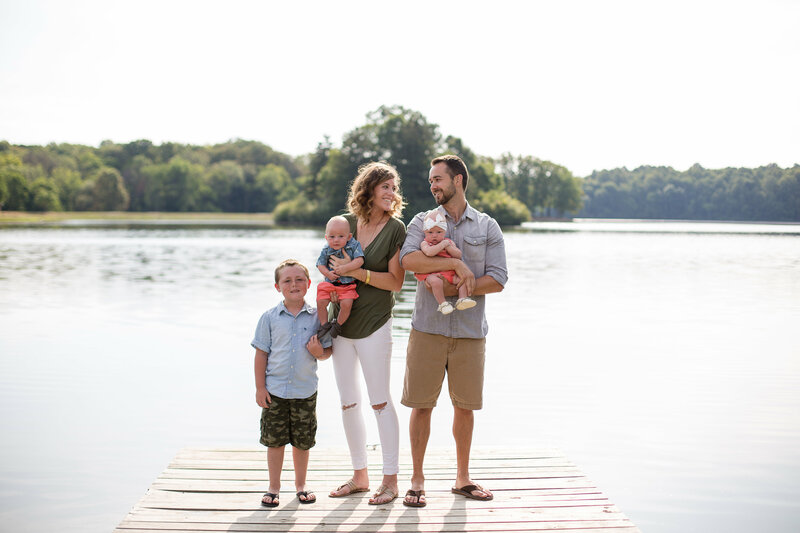 Clearly I have a passion for travel and adventure, but I also have a passion for helping families get out there and make their own adventures. I recently told y’all why we choose to travel so much, (if you missed that blog post, you can find it here). Well, here is the how. I know there are a lot of families who are saying “well, sure we would love to travel more, but it’s just so expensive.” I hear ya. So I’m sharing my top 10 money-saving hacks to make traveling more affordable for families. First thing, you need a credit card that rewards your everyday spending with airfare. I have zero other cards. Not even the Target RedCard – and for those of you who know how much time and money I spend at Target, this is b.i.g. We buy everything with our Southwest card. And I do mean everything. We even paid for a down payment on a vehicle purchase with our card; and then went home that day and immediately paid off the card with the money we had actually saved for the down payment. It was one extra step, cost me nothing extra, but hey, I got the points. We use our credit card like a debit card and don’t carry a balance. Our budget matches our card spending. You need to be careful: I don’t want to get into money management here, but if you spend more than you have and need to make monthly payments with interest you aren’t getting the full benefits of the card. First off, you get 40,000 points after you sign up and begin using the card. That is about enough for two round trip tickets somewhere. There are no black out dates, no change fees, or cancellation fees. In fact if you book a ticket, and that ticket goes on sale – Southwest will refund you the difference of what you originally paid (If you catch the sale). You get TWO free checked bags per person. That’s 10 free suitcases for a family of 5. Most airlines charge you 25$ per bag. If you can’t fit everything you need in 10 suitcases, you may be over-packing. You can earn points by purchasing hotel stays, and rental cars through Southwest. I just recently did this for the first time and their pricing is pretty competitive. You also get a point for each mile you fly with them. Yep, book with your southwest card and that’s double the points for one trip. If you earn enough points from spending, flying, and booking you can earn what they call a Companion Pass. This is gold. It allows you to buy one, get one free on your airline ticket for an entire year. Like I said, pure gold. Oh and did I mention Southwest has some international routes now? Yep, it’s true. Bring on the tropics. Both airfare and lodging prices dramatically decrease during the off-season. Going to Disney or the beach in the fall or winter costs a heck of a lot less than going over spring break or in the prime time summer months. Plus you will appreciate the warmer temperatures if you are leaving freezing ones behind. Different places have different off seasons, so do your research. Typically the cheapest days to travel are on Tuesdays and Wednesdays. Most people have a week for a vacation. There’s no rule that your vacation week needs to run Sunday to Sunday. Afternoon flights tend to be the busiest, they refer to it as the “rush hour” of travel so those flights tend to be pricier. When we’ve been interested in taking a cruise, I’ll call each cruise line and ask them for their cheapest cruise dates, and then schedule our vacation around the best deal. You would be surprise how much dates factor into their price. If you can be flexible enough to wait till the last-minute, you can save a bunch. Both hotels and cruise ships want to be fully booked and will typically drop their prices last minute to fill up. I’ll admit, my A-type personality struggles with this one, and so I can rarely bring myself to roll the dice; but I’ve seen my dad take full advantage of it. My dad will see the cruise he wants to take, schedule his vacation dates, but wait until the week before to book, but he’s gotten some killer deals! Now, this is dangerous because the ship may book up, or the price may not drop. It’s a gamble, sometimes you hit, sometimes you lose. The exception to this rule is airline travel. Typically, if you book a flight late notice you will pay more. Ok this one requires some research. Sometimes its cheaper to buy two one way tickets (even on different airlines) instead of the round-trip. Sometimes it is cheaper to bundle them together. Check it out both ways and compare prices to get the best deals. You have to be patient and put the time in to find the best deals. Also, watch for airline sales. Southwest will randomly have a 48 hour sale, where they will drop all their prices for a short window. Skyscanner.com is the place to start for the lowest airfare. Sounds simple enough, but I think this is often over-looked. There are a lot of cities that have multiple airports or cities with close proximity to each other. Let me give you an example – you want to go to Orlando but plane tickets there are running high. Check the Tampa Airport. It’s about 1.5 hrs away and typically cost less than Orlando. If you already plan to rent a car and can save $30.00 a person on airfare; for a family of 5 that saves you $150.00 dollars. That’s two dinners out for my family. Enroll in a hotel rewards program. It’s free and just like the credit card, you earn points for hotel stays you are already taking. We choose the Hilton Honors Program.. There are a bunch of Hilton properties: Hilton, Hilton Garden Inn, Hampton Inn, DoubleTree, Homewood Suites, Embassy suites, (and many more), so we have a lot of options where we stay. Their rewards system is also in points, that you turn in for free stays. This summer, they have a double points promotion, so you can earn twice as many points per stay. You don’t have to stay in a hotel when you travel, especially if you are going somewhere for more than a couple of days. It’s worth checking Airbnb and HomeAway They are easy to use sites, where people rent out their own properties for select dates. This gives you a full kitchen options which will help in the food department, not too mention a lot more space! Travel with family or friends and split the lodging. Instead of booking somewhere for $150 a night, choose a bigger place for $250. Split the bill between two families – that’s $125.00 a night. For a week-long vacation, you saved $175.00 that might pay for your rental car. Just be sure to pick people you like. Seriously though, this is where most people blow the budget. But it doesn’t have to be this way. This is a huge opportunity area to save money when traveling. Theoretically if you have accommodations with a kitchen, your food budget should stay the same as if you were at home. Just because you are on vacation doesn’t mean that you have to eat out for every meal! If we have a place with a kitchen, we are only eating out once or twice during the whole vacation. So I’m buying the same groceries that I would if we were home. Obviously if you are staying in a hotel without a kitchen space you are more limited, but it’s not the end of the road. First off, always pick hotels with included breakfast. There are several chains that offer a continental breakfast, and several that even offer a hot breakfast, included in the price of the room. And almost all hotel rooms these days have at least a mini fridge. Utilize it and buy things for lunches and snacking on when in the room. Pack your own snacks and waters when you are off on excursions so you don’t have to buy them. You will typically pay more for food and drinks at a tourist attraction than the grocery store around the corner. Buy tickets online and always check Groupon first. Always check Groupon before buying tickets or booking an excursion. Often times Groupon will have an offer that will save you money on your trip. You can even save on local restaurants by searching Groupon first. I’ve found that buying my tickets online is almost always cheaper. The kids and I recently visited Mt. Vernon (George Washington’s estate) on our road trip and I saved $2.00 a ticket by purchasing online and skipped the entry line by having an electronic ticket for them to scan instead of paper. You don’t have to take a big international trip to have a good time. Renting a condo at the beach, especially off-season, is usually very affordable. A week at a lake house might be even cheaper. Almost everything to see and do in Washington D.C. is free. If you can drive there, and rent an apartment for the week, your extra costs will be only your transportation and lodging. National Parks are the way to go for cheap sightseeing. Admission is usually less than $30 for the week and camping can be as little as 6$ a night. With lakes, waterfalls, mountains, and beaches to explore, there is something for everyone. There are so many places to go and see, so get out there! If I missed any money-saving tricks, leave a comment below. Hope this helps turn some of your dream adventures into realities. Pingback: Who couldn't use 8 money-saving travel hacks?